Wooden case with brass front and lever with two spring catches which hold it in one of two orientations. Lever reverses two secondary coils inside two fixed primaries. The secondary coils are spring loaded, the springs also carrying the current for the secondaries. The Duddell magnetic standard was used for the calibration of ballistic galvanometers in conditions similar to those in which they were used. 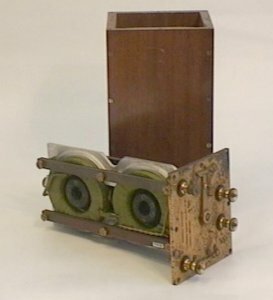 A known direct current of up to 10A is passed through the fixed primary coils, and the galvanometer is connected in series with the secondary coils. Releasing the lever on the front allows the secondary coils to reverse, causing a known flux change through the secondaries, and thereby a known total charge to flow through the galvanometer. The deflection of the ballistic galvanometer is proportional to the total charge, and therefore this allows it to be calibrated. The two primary coils are wound in opposite directions to negate the effect of any stray magnetic fields, and the change in current due to heating is negligible The flux change per ampere of current through the primary coils therefore cannot be changed except by physical damage to the instrument.